I made a mistake when I started recording my newest music video. I feared I would have to start from scratch re-mixing the video tracks for sure. I was just not sure how far backwards I would have to go in the project to fix what I had spent two weeks doing, to get this far. 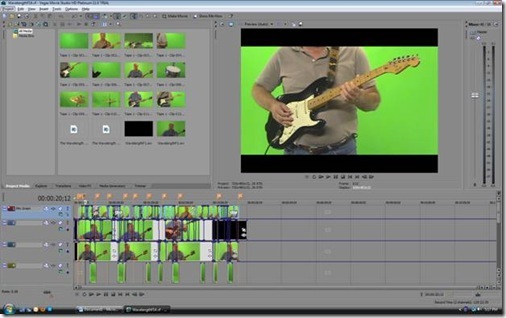 I had been using Pinnacle Studio for video editing and I had done a music video on it previously. But that video was not near as involved as this one was becoming. Pinnacle was not up to the task as it would only allow two video tracks to be used at once. 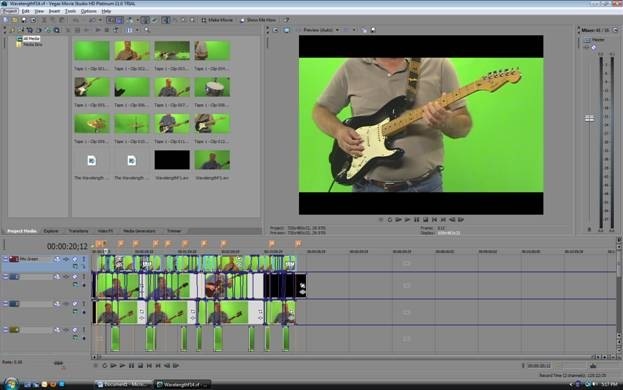 That really turns into one track if you are doing a chroma-key (green screen) video. One becomes the track for the background and then you are left with only one track for your video. That was just not good enough. I tried several other video editing software titles. Many are available as 30 day trials. That may be something you should keep in mind the next time you have the need for video software but not the money or desire to purchase any. Some of these programs offered unlimited video and audio tracks. The one I decided was best and wanted to purchase was Sony Vegas Movie Studio Platinum HD. Vegas comes in a Pro version that retails for around $600 as well. It does unlimited tracks for that price. And it should. The Movie Studio version is retailed at around $129. I found it online for $79. It will only allow ten video and ten audio tracks itself. That is obviously not unlimited, but it is manageable. Besides, it is the easiest to learn, at least for me as it somewhat mimics the multi-track audio program I already use. I also own Sony Sound Forge Pro, which also shares some of its interface, control methods, and appearances. The mistake I made was not setting up the program’s project preferences to widescreen (16:9). My digital camcorder is not high definition, but it will record in 16:9 aspect ratio. It is capable of standard aspect ratio (4:3) as well. It was two weeks before I even noticed the black letterbox lines at the top and bottom of the video I was editing. Once I did notice them, I knew that I had a problem.